We have had a little break from the oppressive heat over the last couple days. It is still hot out, just not as bad as it was. Plus, we've had a little break from the humidity. 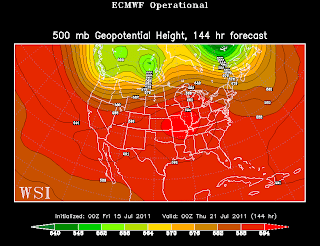 Forecast models are advertising hot air building back east of the Rocky Mountains and central Plains. An area of high pressure will establish itself in the upper levels of the atmosphere. This upper-level high is going to allow for temperatures to likely climb higher than the models are indicating at this time. Over time, this upper-level high, a.k.a. 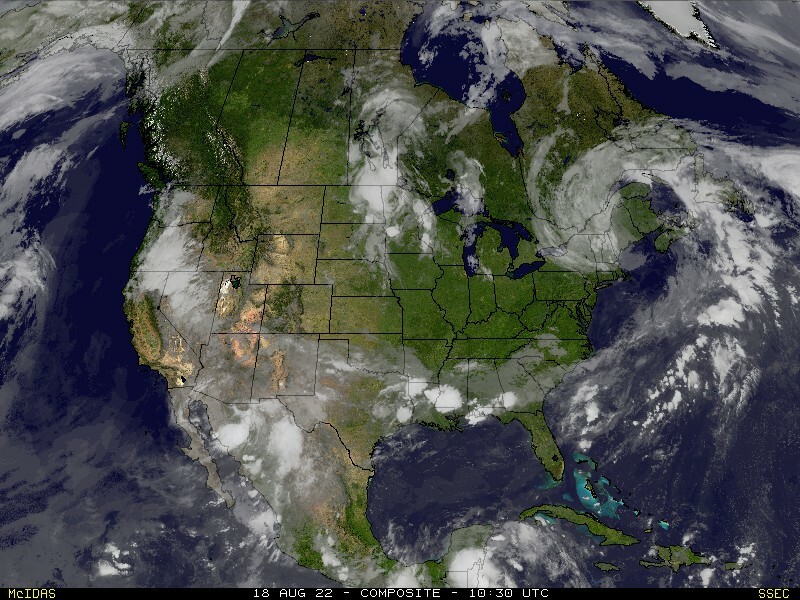 Hot Dome, will move to the east over Missouri, Illinois, Arkansas, Kentucky, Tennessee and Indiana. 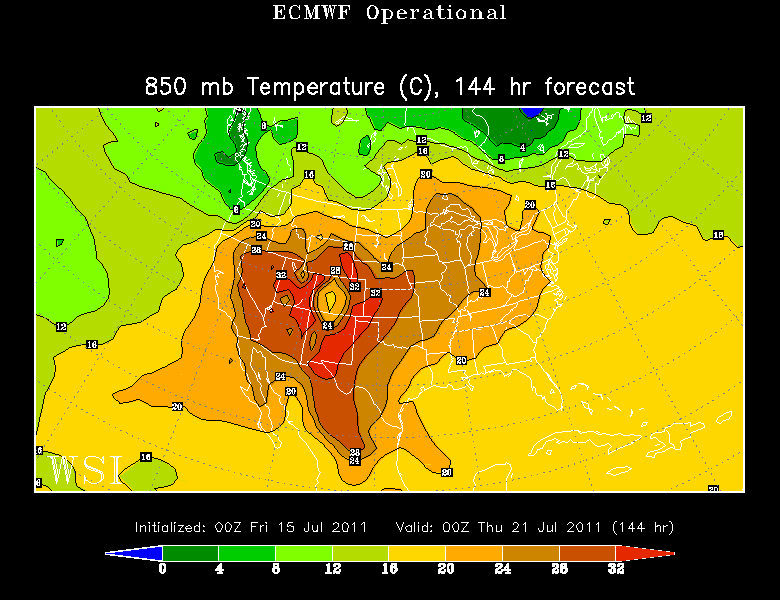 Here is a look at the European Forecast Agency's computer forecast model's projection for 7pm CT Wednesday, July 20. What you are looking at is the atmosphere at 500mb (approximately 18,000 feet). This is the level that I am looking at for the upper-level high. You can see it centered over St. Louis. It is the area inside of the 594 line. With high pressure, air sinks. As it sinks it compresses. When a gas, in this case air, compresses it heats. This is what usually causes extremely high temperatures in the summer. Since the high will be right over the Midwest, temperatures will likely be high. 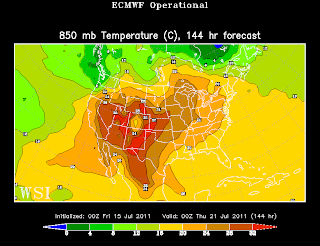 Here is a look at forecast temperatures by the European model for the same time frame. The image is showing the temperature in Celsius at 850mb or approximately 5,000 feet up in the atmosphere. Most likely the computer models do not have a good grasp of the higher temperatures just yet. I suspect we'll see the models trending warmer for next week over the weekend. Highs will likely top out in the upper 90°'s to maybe 100° by mid-week. 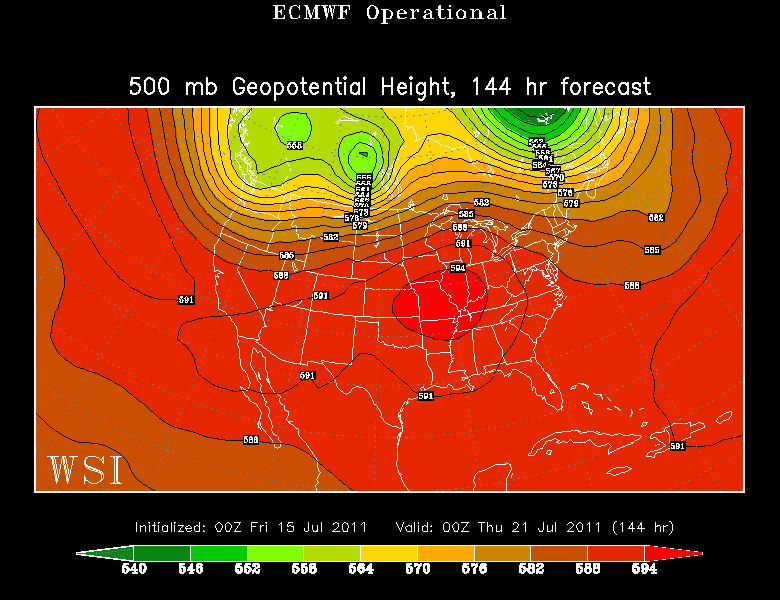 The timing of the heat obviously depends on how quickly the upper-level high moves in to the Midwest. Regardless, have your air conditioners, water bottles, pools, slip-n-slides and fans ready to go for next week!